Scleromochlus taylori was a little reptilian biped from the Late Triassic of Scotland. The several fossils that are known are preserved as crushed impressions in sandstone. The long legs and slender arms of Scleromochlus immediately set it apart as something very special. Figure 1. Scleromochlus, a basal crocodylomorph. That's a sister taxon, Gracilisuchus in the upper right hand corner. Woodward (1909) first described Scleromochlus taylori as a dinosaur. Von Huene (1914) reassigned it to the Pseudosuchia. Padian (1984) considered it an Ornithodiran, allied to both pterosaurs and dinosaurs. Sereno (1991) considered it a sister to pterosaurs. Padian (1997) named the clade containing Scleromochlus and pterosaurs the Pterosauromorpha. Benton (1999) used 16 taxa to determine that Scleromochlus was basal to pterosaurs, Lagerpeton, Lagosuchus (Marasuchus) and the Dinosauria. Phytosaurs and Proterochampsa were outgroups. Bipedal crocs were not included. The absurdity of these nestings were discussed in an earlier 3-part blog. The linking of Scleromochlus with pterosaurs is also embarrassing. Scleromochlus had tiny fingers, a terminal naris, a deep antorbital fossa, too few cervicals, too deep chevrons and no pedal digit 5, among several other discrediting traits. Cosesaurus is a much better pterosaur sister. It was similar in size to Scleromochlus and had a pteroid, prepubis, extradermal membranes, a long fifth toe, a long fourth finger and other traits shared with pterosaurs. Terrestrisuchus is a much better sister to Scleromochlus (Figure 3). The present large study demonstrates that pterosaurs and Scleromochlus were not closely related. Even turtles nest closer to pterosaurs than Scleromochlus would. Here Scleromochlus nests within the base of the Crocodylomorpha close to Terrestrisuchus, Saltopus and Gracilisuchus. Surprisingly, no one but Peters (2002) has considered Scleromochlus a crocodylomorph (see Wiki links below) despite the obvious similarities (Figure 3). Benton (1997) reconstructed Scleromochlus with a posterior-leaning quadrate, as in pterosaurs, but there is no evidence for this. In doing so, Benton reconstructed the skull with a hyper-extended retroarticular process with a quadrate articulation nowhere near the articular bone. The Scleromochlus skull is much wider than tall and the many samples were crushed dorsoventrally, obliterating any data on the orientation of the quadrate. Given an alternate anterior leaning quadrate (Figure 1) the problem with the retroarticular process is removed. Figure 2. Scleromochlus according to Benton (1999). Red arrows and captions indicate dissimilarities with pterosaurs. A comparison with Terrestrisuchus, Gracilisuchus and Saltopus is instructive. Each had been considered bipedal. Each had a small upright scapula, a reduced calcaneum and an elongated, appressed metatarsus. Gracilisuchus shared robust cervical ribs, a lumbar region, a short tail and a flat-topped ilium. The palate configuration was virtually identical. 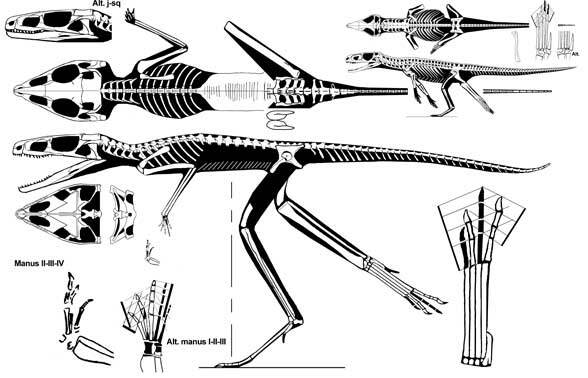 Saltopus had tiny fingers, more than two sacral vertebrae, a longer tibia than femur and an elongated hind limb. 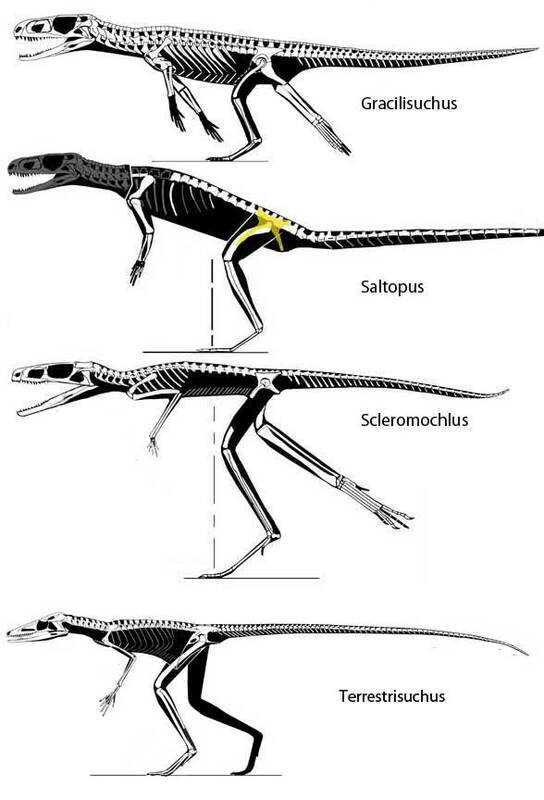 Benton and Walker (2011) apparently misinterpreted the ephemeral sacrals of Saltopus by deciding that only two were present and elongating each one twice as long as proximal dorsals and caudals, unlike the situation in its other sisters. Terrestrisuchus had a smaller skull and longer neck, but was otherwise virtually identical to Scleromochlus. Scleromochlus taylori (Woodward 1907) Late Carnian, Late Triassic ~217 mya, 18 cm long, was derived from a sister to Decuriasuchus, Lewisuchus and Pseudhesperosuchus at the base of a clade that included the crocodylomorphs Gracilisuchus, Saltopus and Terrestrisuchus. Read more about Scleromochlus here. Huene FR 1910. Ein primitiver Dinosaurier aus der mittleren Trias von Elgin. Geol. Pal. Abh. n. s., 8:315-322. Peters D 2002. A New Model for the Evolution of the Pterosaur Wing – with a twist. Hist Bio 15: 277–301. Senter P 2003. Taxon Sampling Artifacts and the Phylogenetic Position of Aves. PhD dissertation. Northern Illinois University, 1-279. Sereno PC 1991. Basal archosaurs: phylogenetic relationships and functional implications. Journal of Vertebrate Paleontology 11 (Supplement) Memoire 2: 1–53. Woodward AS 1907. On a new dinosaurian reptile (Scleromochlus taylori, gen. et sp. nov.) from the Trias of Lossiemouth, Elgin. Quarterly Journal of the Geological Society 1907 63:140-144. This entry was posted in Archosauria, bipedal, Crocodylomorpha, dinosaur origins, evolution, pterosaur origins, reptile family tree, Triassic and tagged Archosauria, bipedal, Crocodylomorpha, digitigrade, dinosaur origins, pterosaur evolution, pterosaur origins, transitional taxa by davidpeters1954. Bookmark the permalink.